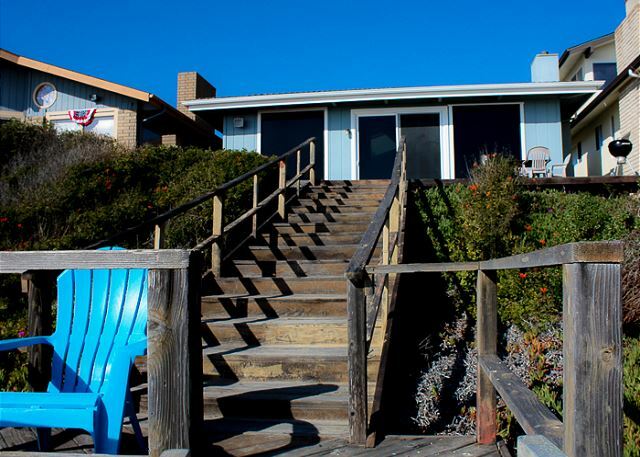 Roomy split level ocean front home with a large deck and stairs to the beach. 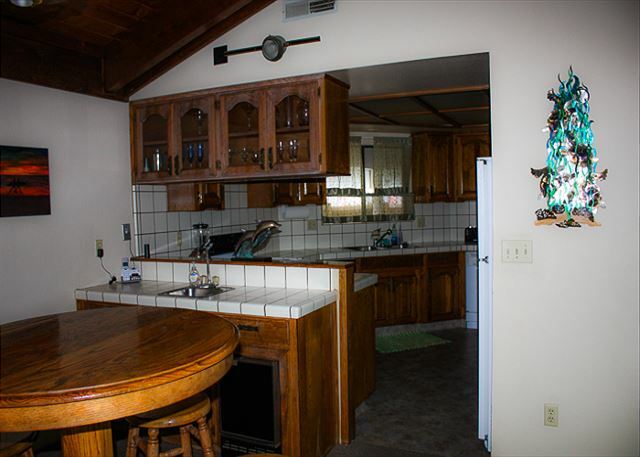 On the ocean side of the house you will find the living room, breakfast table, and kitchen. The living room has access to the private deck. 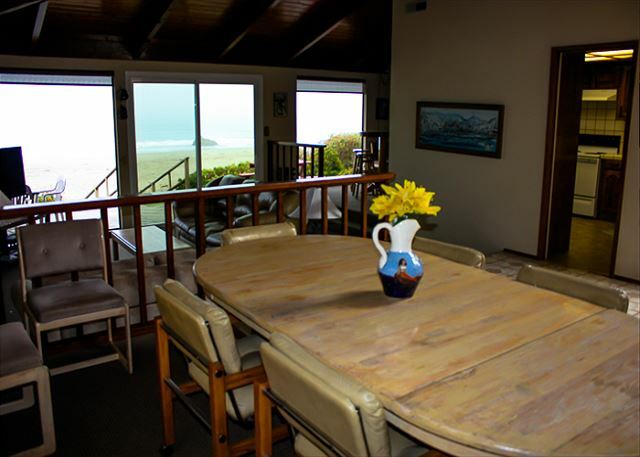 The dinning area is located above the living room and also has spectacular ocean views. 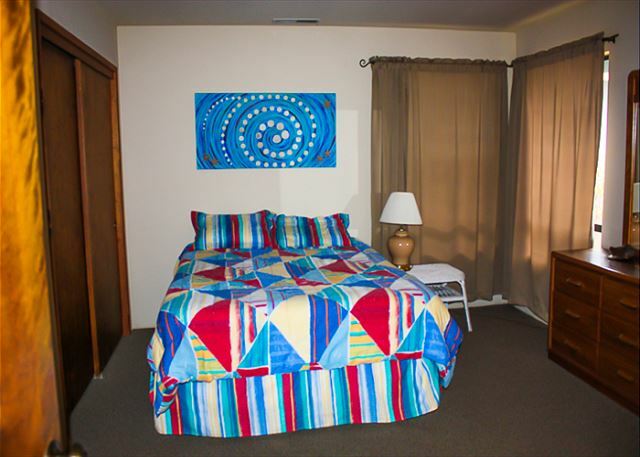 Towards the back of the home you will find the three spacious bedrooms and bathrooms. The house has a private deck and stairs the beach. No Fireplace. 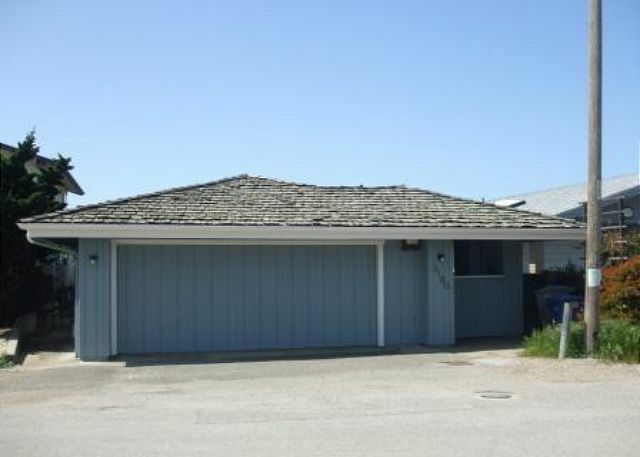 The home is perfectly located close to downtown Cayucos and Morro Bay. No smoking, no pets, linens & towels not provided. NIGHTLY MINIMUMS VARY SUMMER AND HOLIDAYS. The location and view are AMAZING. The living area is comfortable and the kitchen is easy to use. We had a very nice time there! Best Thanksgiving in years. While the weather was rainy, we all enjoyed ourselves playing board games, watching movies, etc. House could use some updating but overall, great place for a family to hang out at. House had spectacular view - although the king bed was good but the other ones which the twins were really hard and the other big bed very squicky. 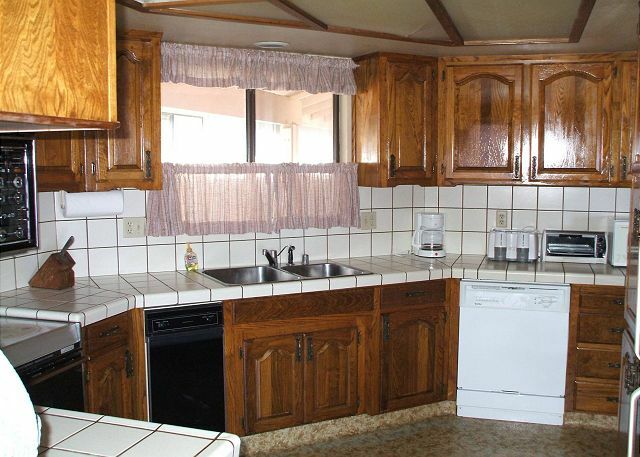 The sink was clogged which the carpet was soaked, the plumber was there when we arrived, the sliding screen was already torn, other than that it was great, but next time we need a pet friendly house on the beach which I hope you folks can help me with. 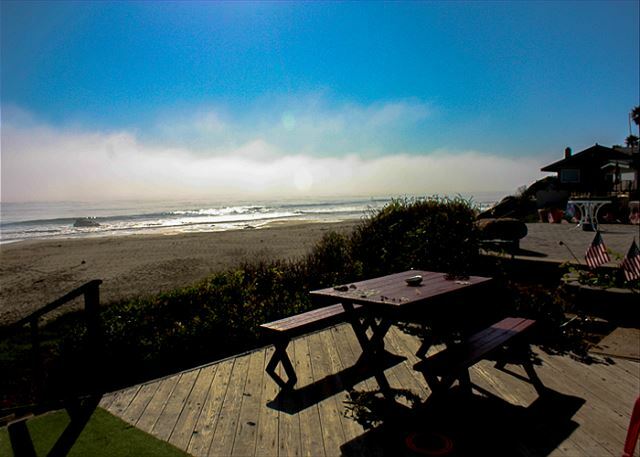 Great view and proximity to beach! The view and location of this house is amazing. We had a great time. The deck is expansive and the house is huge. Points to consider before renting which are not disclosed. The steps pictured do not go all the way to the beach. You must take a small metal step system near the bottom. It is not for the mobility challenged. You can not put a SUV in the garage and parking is minimal outside. This is an older home that has not been renovated. This is not an ADA friendly home. 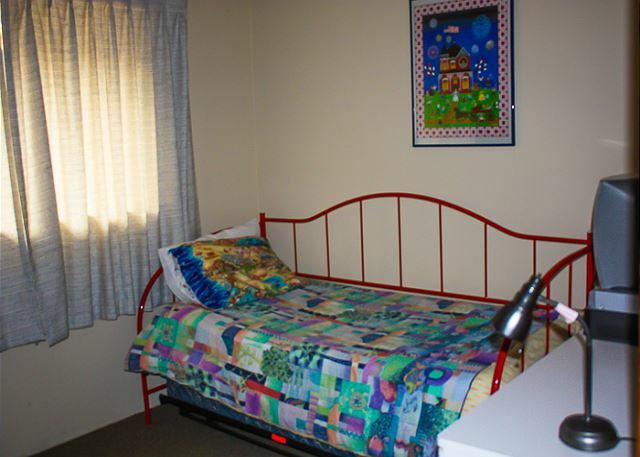 The two twin beds are a day bed with a trundle. This really only works for kids. The rental company got the job done and the fees are appropriate for what you are experiencing. If looking for a good time with friends or family and you don't need the luxury surroundings, this is a great choice. Each year we rent from Coastal Escapes we are never disappointed and the staff have always been kind and helpful. This is the only rental company we use for our Central coast vacations. Thank you for the continued memories!! 3180 Studio Drive is the Place! We stay at 3180 Studio Drive annually. 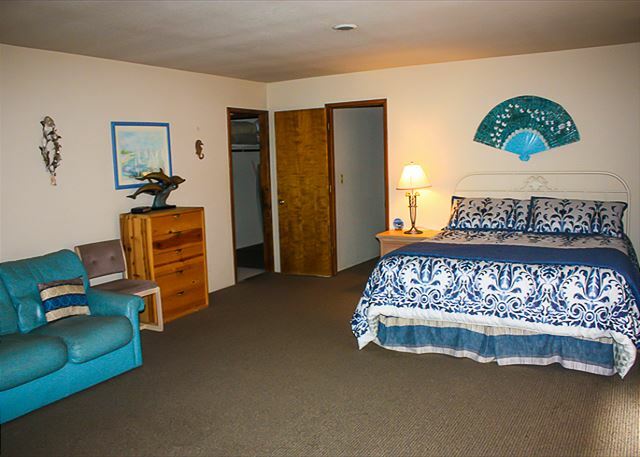 The location offers quietness and a relaxing vacation. The view is spectacular. The accommodations is perfect for our family to have family meals together and play games around the big dining table. Long walks on the beach and a fabulous view. The highlight is the view. We had our meals on the patio and watched the dolphins, surfers and dogs ... and of course the beautiful sunsets! We stayed over spring break with another family of 4 and had a fantastic time! The house is roomy and works great for two families and the views are breathtaking. We loved the large deck, although several of us got splinters, and we loved the proximity of the house to the ocean (didnt' have to walk a lot across sand). We will definitely be staying at this house again! Wonderful stay, very professional, house was clean but outdated. Well, we have been using Coastal Escapes for quite a few years now. Every year we rent a beautiful home, get great customer service from your office staff (THERESA!! !, and are extremely satisfied with the outcome. I have always and will always recommend Coastal Escapes to our friends. Tanks you soooo much! WE HAVE STAYED AT THIS HOUSE THE PAST 25 YEARS PROBABLY AT LEAST 15 TIMES. WE ALWAYS HAVE A GREAT TIME. THE HOUSE HAS GREAT VIEWS INSIDE OR OUT. THE AREA ON THE BEACH IS ALWAYS CLEAN AND PEACEFUL. A place where priceless family memories are made. This is a great place, but the carpet really needs a good cleaning. And I would suggest again to put a queen bed in the second bedroom. The day bed does nothing. And for whatever reason only one person can shower at a time and no other water can be turned on or you lose water pressure completely. The front shower would back up too. GREAT location but it is time for the owners to update the place and do some maintenance. It was a Spring Break well spent!!! This house is all about LOCATION and STUNNING ocean views!! Management company great to work with and stellar location! Enjoyed our stay! We were there last year for my birthday in May and return this year November for my husbands birthday. We look forward to going again! One of the best places anyone can ask for. Loved it and enjoyed it to the fullest. Many many thanks. Great weekend at this beach house. 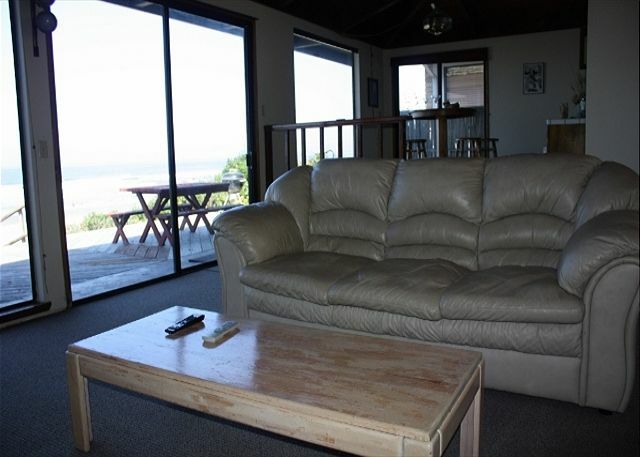 House is in a great location with great views of the beach. 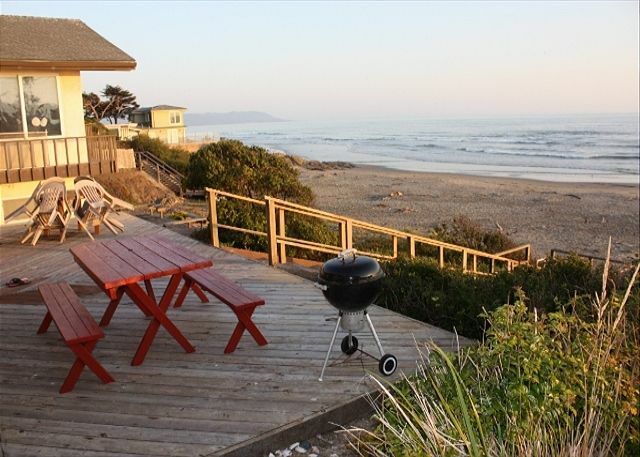 Would recommend this house to anyone who plans on visiting Cayucos. Excellent. Weather great. We Ray at this same house every year. Great house lots of room and great views. The only thing I would suggest is putting a queen bed in the room with the day bed. My family and I had a great visit, even though it was just a short stay. One of my daughters also rented a different house near us. Our plan is to come to Cayucos more often. thank you for your hospitality. We had an amazing time here. The house was well stocked and the stay was great. This is our second stay in this house and it is overall a great house. Just a couple of heads up. A lot of the dishes were dirty so definitely check them before using them. And the water heater was off so I would check that when you arrive or you will be taking a cold shower the next morning. Beds are ok not the most comfortable but they work. The shower in the master is very difficult to get into because of the spa tub. It would be nice if it was a regular tub. WE HAVE BEEN GOING TO CAYUCOS FOR OUR SUMMER VACATION FOR THE PAST 23 YEARS. WE LOVE IT. WE GO OVER THE TO VEGG. WE TAKE ALL OUR FOOD AND ALCHOL SO WE DON'T EVER HAVE TO LEAVE THE HOUSE IF WE DON'T WANT TO. WE HAVE FRIENDS THAT COME OVER AND ENJOY THE BEAUTIFUL BEACH AND RELAXATION. WE GO TO THE BEACH AND BUILD OUR SAND CASTLES EVERYDAY AND THEN WATCH THE OCEAN COME IN AT NIGHT AND TAKE THEM AWAY. WE LOVE IT. WE HAVE STAYED AT THIS HOUSE OFF AND ON FOR THE PAST 15 YEARS. I KNOW THAT THE HOUSE HAS ALOT OF PEOPLE COMING AND GOING ALL YEAR LONG, BUT THE HOUSE JUST SEEMS TO BE GETTING RUN DOWN. THE CARPETS AREN'T AS CLEAN AS THEY NORMALLY ARE AND WE HAD A LITTLE ISSUE WITH THE KITCHEN PLUMBING, WHICH THEY HAD FIXED RIGHT AWAY. We had a great time great view. We will do it again thanks for great memories. We had a wonderful time at this house. It had plenty of space, and you can't beat the views and access to the beach. The deck is older, so I would advise wearing shoes or flip flops - a couple of us stepped on sharp nails. The furniture is definitely older, and we were disappointed that the pull out sofa was broken, as we had counted that when we booked it as an extra bed. Thankfully, we brought a blow up mattress just in case we needed extra sleeping space. Everything else was perfect, and we had a fabulous time. 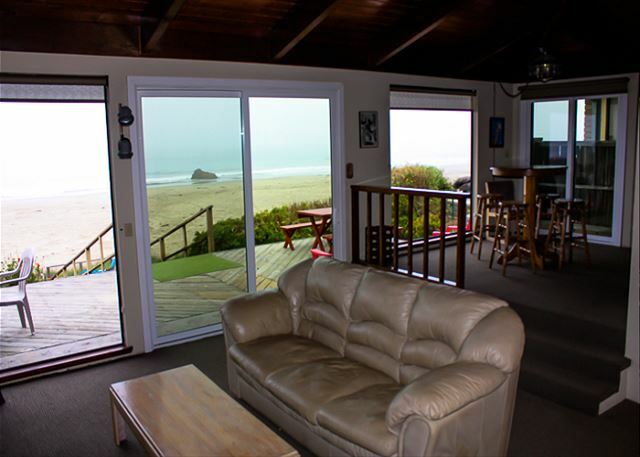 We've been coming to Cayucos for around 25 years and always have rented from Coastal Escapes (or it's predecessor). The staff is friendly and they always have takn care of any needs we have. Barbeques always seem to be an issue due to salt air an use; howevever, anytime we've found one that was substandard-they have replaced it within a day. We prefer locations on Pacific due to proximity to the town so hope rental additoinal properties in this area could be secured. Rhonda and Theresa are wonderful! Relaxing and enjoyable! Great view... We even seen whales. Great view and such easy access to of the ocean. It was relaxing and fun for the whole family. We will definitely be back. We have stayed at several different locations in the last 10 years. This was our first stay at this home, and all I can say is WOW. This is by far the best of the best. Everything was great not one compliant. And Rhonda and Theresa are as always great!! We have stayed at this house numerous times over the years. Love the house and the deck. It was wonderful being so close to the ocean. Our family needed a change of scenery for Thanksgiving this year with births of babies, death of a my wife mom, and one of our dogs also. So, it was wonderful for everyone. Beautiful home. The house was fine. And, Theresa, Rhonda, et. al. were wonderful, as usual. We will be back! Great time! The pull out in living room a joke! Don't count on it! Only wish was that the neighbors would turn their lights out so we could enjoy the view better at night! Gorgeous location right on the beach. Only complaints were problems with the refridgerator. Leaking and broken shelf. And the twins were uncomfortable. But those were minor! The refridgerator has been replaced with a new and bigger one now. 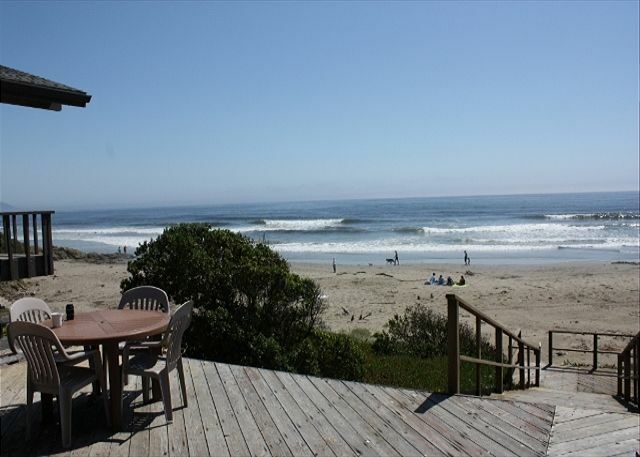 Best week rental in Cayucos, we've rented 5 other places, this is the best one. We've spent 3 summers here, love this house. My family and I have been going out to Cayucos over the past few years to celebrate my birthday. This was the first year we were fortunate enough to stay at a beautiful ocean front home. The house was amazing! It was spacious, clean, and the view was incredible. I plan on returning next year (if not sooner!). Once there, I did not want to leave.. while BBQ on the deck, the family relaxed on the beach.. everyone had a hard time leaving this beautiful place :) I would highly recommend this property to anyone! 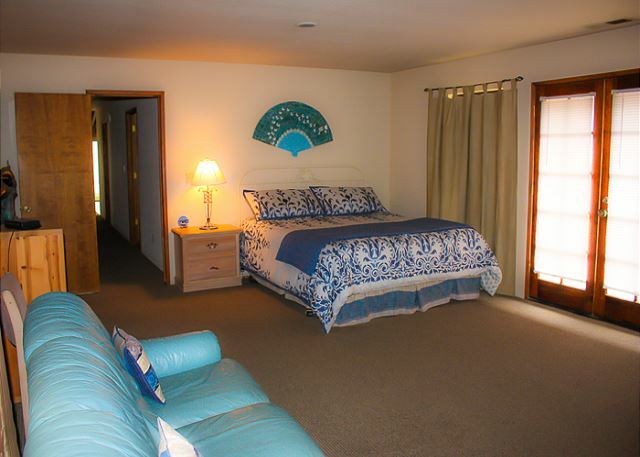 We had a wonderful time in this ideally-located house on the beach. The weather happened to be absolutely gorgeous, too, so we lived the ease if going right out to the water. Just a couple small maintenance things but otherwise highly recommended. Great price for all the costs entailed. Great place - great location! Plenty of space... Has WiFi! We love the house. We have stayed there numerous times over the years. The house deck and views are all great. Great house for a family. We love it. We rent the same property yearly. ONLY NEEDS A MINOR DECK REPAIR, A NEW FIREPLACE SCREEN, COASTAL ESCAPE'S THERESA AND RHONDA ARE GREAT PEOPLE! Thank you for letting us know of the problems. Repairs to deck have been completed and we are working on the fireplace problems. 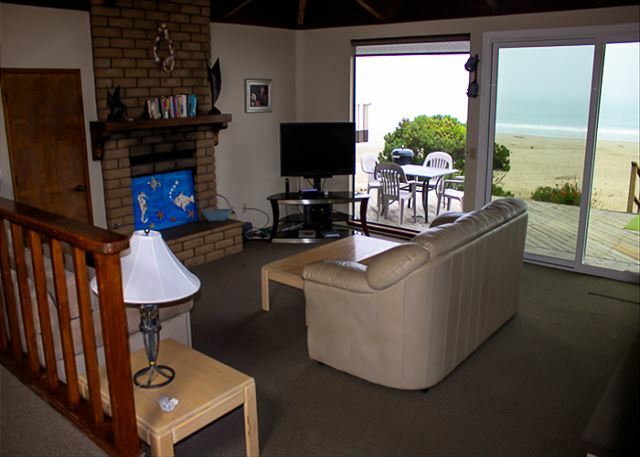 Wonderful stay at 3180 Studio Dr.
Our 2 yr. old grandson summed it up the best when he saw the view of the ocean from all the glass on the west end of the house and exclaimed, "WOW!!!!". The house was very nice. We were a little disappointed that we weren't in walking distance of downtown Cayucos, but the access to the beach was great!! We also couldn't get the hot tub in the master bath to work, but all in all we had a great time and made wonderful memories for our family!! Thank you Coastal Escapes!!! this house is the BEST!!!!! We had a wonderful, relaxing week! The weather was fabulous, our kids enjoyed digging in the sand, and as usual we enjoyed Duckies for lunch (a few times!). We saw dolphins, seals and sea otters right from the house. The house was huge. Had plenty of room! The only complaints are the beds are a little uncomfortable and the wood deck gave our 3 children a lot of splinters! So shoes on when on deck and it'll be a fantastic trip! Everything was great except one of the "twin" beds was a flimsy trundle bed and the sleeper sofa was HORRIBLE...we slept on the floor instead!!! Great location; a playground in your backyard! We have stayed in this house for 4 years so far and plan to continue for years to come. 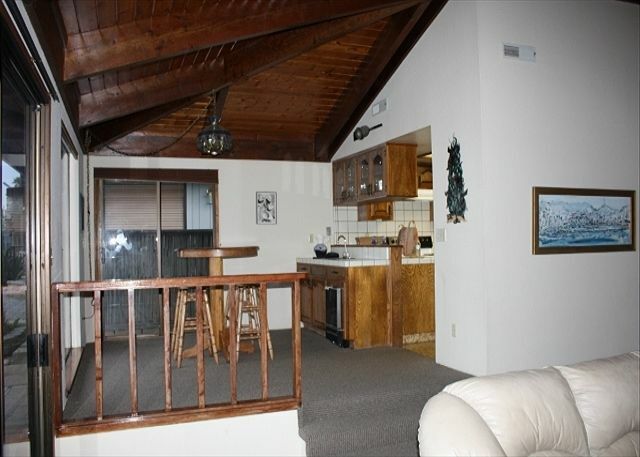 The home is large enough to accomodate our family with the large deck and living room. 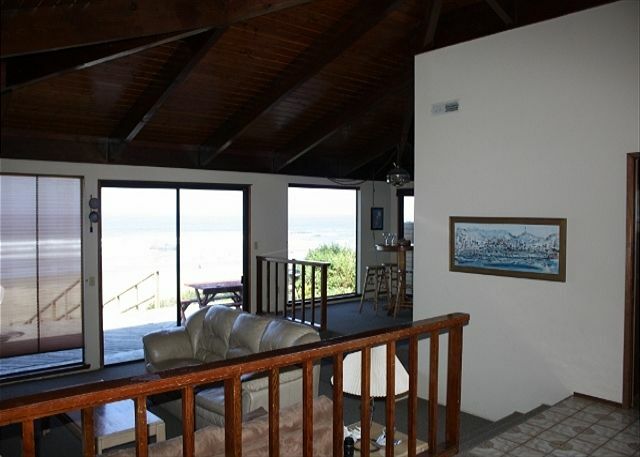 The large windows are wonderful for enjoying the beautiful ocean view. 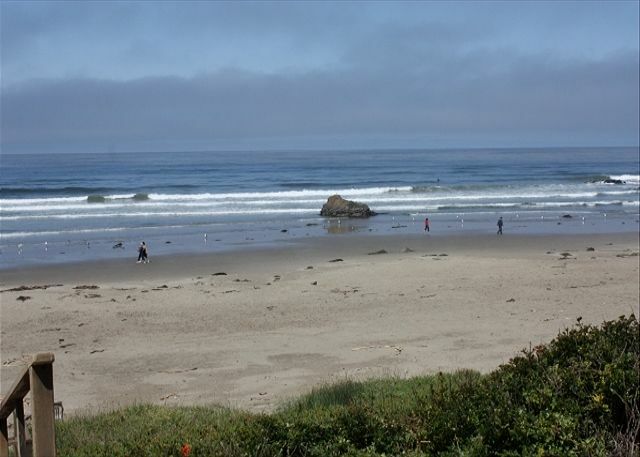 We love the Cayucos beach town as well. the only problems were 1)could only find one tv remote. 2)lamp shade broken in first room. 3)kitchen sink clogged(it was taken care of). otherwise we had a wonderful time! We had a wonderful time at the house, the view was great, and the beach was wonderful. 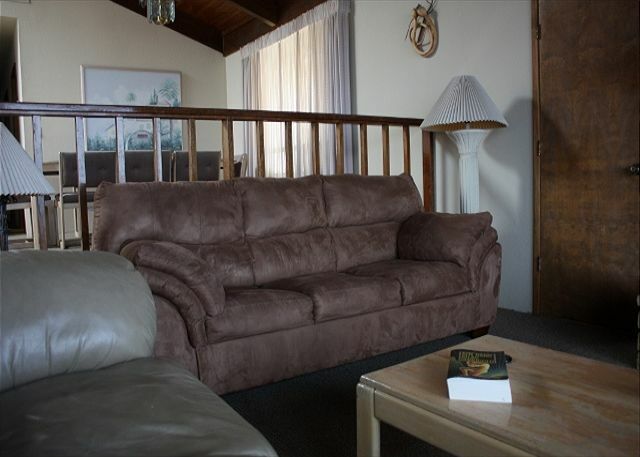 Some of the furniture is old and needs to be updated, to support the rental cost. Great location, right on the beach. The house is very comfortable with a large outdoor deck. We loved our stay. BTW be sure to eat at Taco Temple. We liked it so much we ate there three times in seven days! Great everything! This home is spacious, clean, had awesome views, large deck, safe stairs and close to everything! Great for families! THank you for acomadating us at the last minute it was very well worth it.Thanks again see you next year. 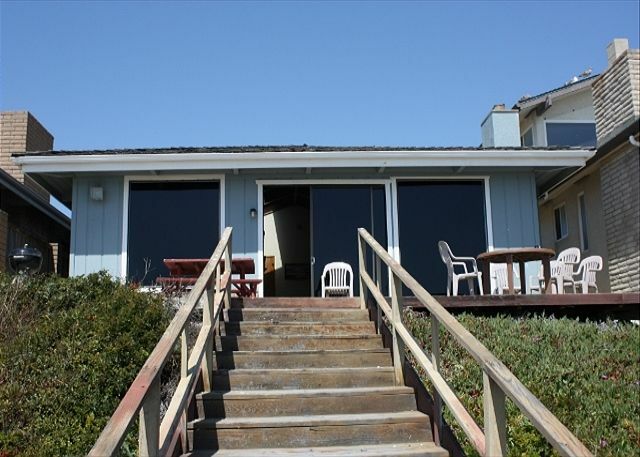 We have stayed at this property twice so far and it will be the site of our annual beach stay in Cayucos! 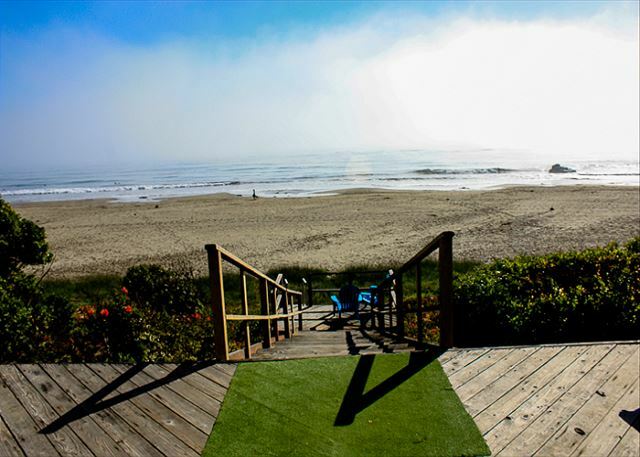 It's a great house, lots of room, great location and beautiful beach! Our family loves it! My only suggestion would be more lighting, as it was hard to read or do puzzles with the current lighting. Everything was great. The only thing is there is not great lighting in the house for the evenings. Hard to play games at night with the family. Loved the new carpet. We had a great weekend! Thank you very much. not enough cleaning supplies and the pots and pans were very old. no teapot or blender, fireplacenot working, the twin beds were too worn out, the pull out sofa was very old and worn out. House was in a beautiful location. Deck and living area was spacious and pleasant. Furnished with plenty of cookwear and dinnerwear. Could not qualify this as sleeps 8-pull out sofa was very old and mattress was basicly unsleepable! Furniture was pretty worn, sofa was very dirty and the carpet was in need of shampoo. Quiet stay for the weekend! My friends and I were looking for a quiet getaway for the weekend and we got just that. The location (right on the beach) was just right. Twenty minutes away are Templeton and Paso Robles where all the wineries are. We definitely had a fun day just visiting different wineries. Overall, it was a great experience albeit the weather was a little bit on the cold side in May. This place was definitely great for larger gatherings, very comfortable! !